This Interactive Workbook CD is perfect for users of Juki Series Sergers. It contains useful tips, hints, and explanations to make even complicated serger ideas and projects a breeze. 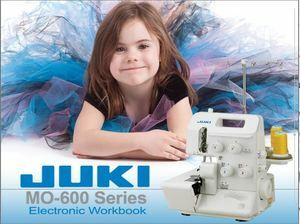 The Juki Interactive Workbook CD covers all the basics on your Juki MO623, MO644, MO654DE, MO655, MO734, MO735 serger. 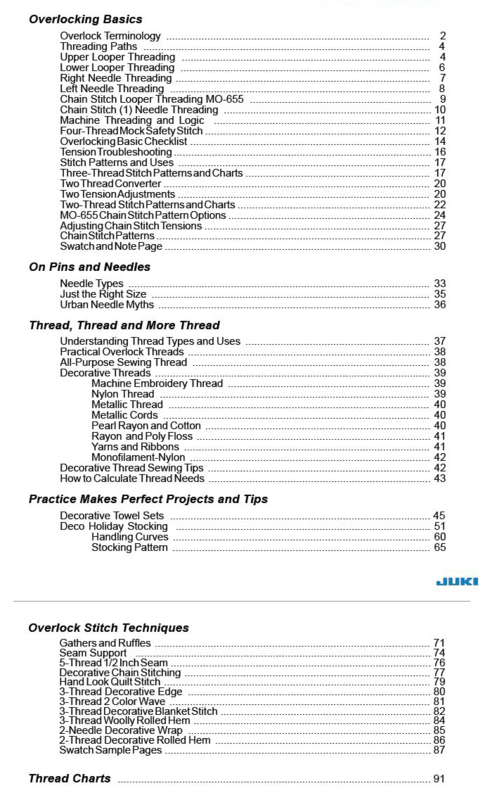 It contains a wide variety of of topics like threading, needles to use, serging techniques, serger presser feet, and more. This workbook is a great resource—no matter what type of serger you own. It's filled with useful information, from basic overlock terminology to fun projects to create. Select and view a specific techniques or instructions with a click of the mouse. You can also print the entire workbook or individual techniques or subject areas. Just place the CD into your computer's disk drive to get started. A great resource no matter what type of serger you own. I have purchased a lot of items from ALLBRANDS including sewing machines and sergers and have been extremely pleased with the products, price and speed of delivery.....will continue to shop with you.